Bartlett scored a career best 133 from 223 deliveries, with 17 fours, before shouldering arms and losing his off stump to Luke Fletcher, who took three for 66 as chief support for Stuart Broad. Broad, bowling with good pace and rhythm throughout, had taken two wickets on the first evening and polished off the Somerset tail to close with five for 73. Abell, who took a hat-trick in this fixture last season, played a starring role with the bat this time, making 101 after adding 223 for the fourth wicket with Bartlett, a county record against Notts. The visitors were ultimately dismissed for 403, having built up a first innings lead of 140. The morning session produced exactly 100 runs and by the interval the West Country side had moved to within 89 of the Nottinghamshire first innings score. But Patel wasn't able to split the two right-handers as they both reached their hundreds. The tea interval worked in favour of the home side because they struck, unexpectedly, twice straight after. Steven Moores nicked Jake Ball behind for 22, from his first delivery after the resumption. Gregory comfortably saw his side beyond a fourth batting point and led the charge for a fifth, reached shortly after pulling Broad for back-to-back sixes. His fifty occupied only 47 deliveries and included four fours also. 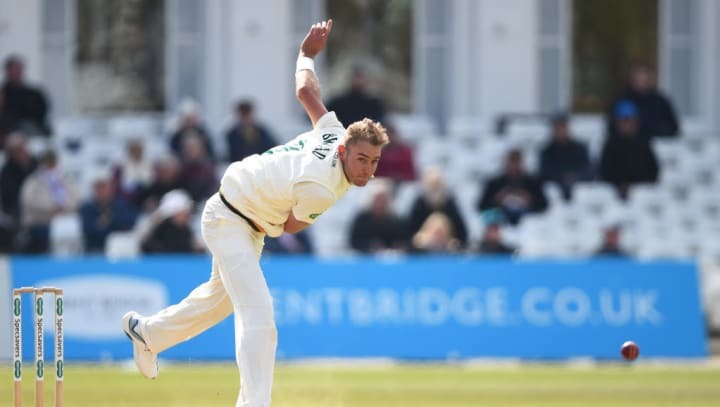 Broad blew away the tail, dismissing Josh Davey, Gregory and Jack Leach in quick succession to leave Notts with a tricky half half-hour to bat in fading light. Join us as a Member for access to every home County Championship game, seven home T20 Vitality Blast fixtures and four Royal London One Day Cup matches from £29 by clicking here.